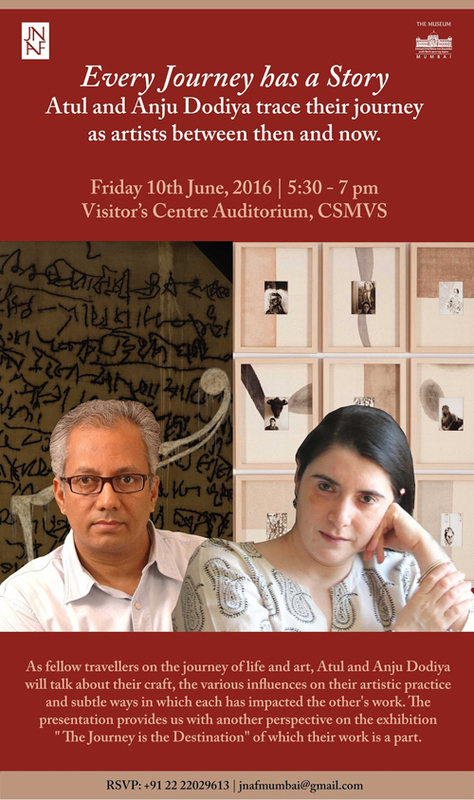 The JNAF and the CSMVS are delighted to have Atul and Anju Dodiya join us at the Museum, on the 10th of June, to share the story of their artistic journey over the years. "Every Journey has a Story" will have audio visual presentations by both artists for 45 minutes each, followed by a question and answer session. The event provides us with another perspective on the exhibition " The Journey is the Destination" of which their work is a part. Join us on the 10th of June, 2016 at the Visitor's Center, at 6pm. Tea will be served at 5.30pm.